Starting Young is about the critical early years, when children are developing faster than at any other time. It explains why, for children growing up in deprived situations, good educational support can make a huge difference both to their resilience, and to their ability to keep learning through life. 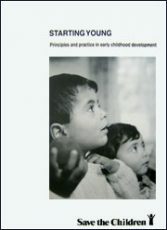 Based on Save the Children’s experience of working with early childhood development programmes around the world, this booklet describes the kinds of early childhood work that are the most appropriate, and explores the potential for achieving real, and sustainable, benefits for children.